As the winter winds down, you may find yourself looking in the mirror with a sort of dull grey film over your skin. The truth is all those months of bitter cold, lack of sun, and dry indoor heat has taken its toll on your face. You need to scrub away the past and perk up your pasty self, getting your skin in glowing condition. The cheapest way to polish your complexion is by incorporating a face scrub into your beauty ritual. Do this every day for about a week, then take it down about every few days. You can try my favorite inexpensive method of using a handful of regular white sugar (see my previous post My #1 Secret To Soft Skin–And It’s Cheap!) mixed with your daily cleanser or buy an exfoliator containing fruit enzymes to gently slough off dry old skin. Another good exfoliating tactic is to use an electronic facial brush like the Clarisonic Skincare Brush . Want to treat yourself to a pro treatment? A microdermabrasion treatment from your dermatologist instantly smoothes your skin and eliminates dullness. The new silk peel microdermabrasion uses a solution of hydroquinone for spot fading and penetrates deeply for truly fresh new skin. I like to treat myself to one of these at the start of each new season to jump start my glow, boost new cell growth and improve circulation. A face primer will also help boost radiance. 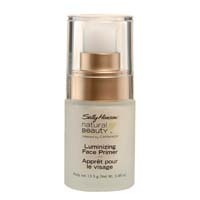 Try Sally Hansen Natural Beauty Inspired By Carmindy Luminizing Face Primer before you apply foundation. The light-reflecting particles create a radiance that will boost your glow, making you look refreshed. You should also go for a rosy cream blush swirled on the apples of the cheeks. This trick can help any face look fresh and fabulous in seconds.